The enthusiasm and energy of young people is undeniable. When applied to a charitable project - and given freely with love - well, that is undeniably inspiring. And so it was for hour upon hour on Tuesday, November 29th at the Chicago High School for Agricultural Sciences as hundreds of students joined meal packaging production lines to produce 26,000 nutritious meals of pasta and cheese, fortified with vitamins and soy protein, for hungry Chicago-area children and their families. Not surprisingly, these very bright students were quick learners - mastering the production process - wearing aprons, gloves, and hairnets - laughing, smiling, and swaying to Lady Gaga and Michael Jackson. It was an act of caring, resonating with the spirit of the holidays, and reflective of the giving character of the school;s students, faculty, staff, and administration. And even more meritorious, in addition to the donations of hundreds of hours of service, the $6,500 that funded the food packaging event was raised by the students themselves! And the 26,000 meals? With the growing population of hungry children - nearly one out of four in northern Illinois - these meals were distributed through the network of soup kitchens and food pantries serviced by the Northern Illinois Food Bank which received the meals. The Chicago High School for Agricultural Sciences (http://www.chicagoagr.org/) is a college preparatory high school that provides opportunities for diverse students from across the city to study agriculture with the goal of developing marketable skills as well as college level competencies. It will produce technologically proficient graduates who will have the power to change the image of urban agriculture. The Chicago Board of Education created the Chicago High School for Agricultural Sciences in July, 1984, and in September, 1985, it opened its doors as the newest high school in the Chicago Public Schools, attracting students from all parts of the city. It was established at a time of great concern about the future of agricultural education and the agricultural industry in general. There is a nationwide effort underway to broaden the scope of teaching in and about agriculture beginning at the kindergarten level and extending through adulthood. At the high school level, there is strong interest in shifting the curriculum toward agribusiness and plant and animal sciences. Too few agricultural college graduates are available to fill the need for new professionals in agricultural science and business. Outreach (www.outreachprogram.org) is a 501(c)(3) charity based in Union, Iowa, that partners with service organizations, schools, churches, social groups such as Rotary or United Way, or corporations - to organize and host food packaging events. To these events, held in church halls, school gymnasiums, and even stadiums, come hundreds, sometimes thousands, of volunteers - each prepared to pay $25 and donate an hour or two - to package 100 meals for the hungry and food-insecure in this country and abroad. 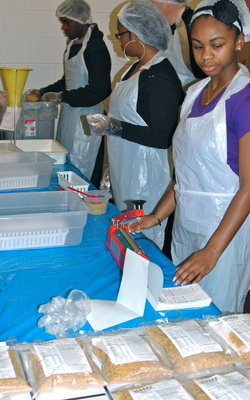 The volunteers are organized into small group assembly lines - creating the portioned meals from bins of bulk ingredients. Six meals go into each labeled, clear plastic bag. Currently, Outreach offers three nutritious meals - a rice-vegatable casserole; rice and beans; and pasta and cheese - all fortified with soy protein and nutrients and vitamins. Volunteers employ safety and hygienic precautions, including hairnets, aprons, gloves and frequent applications of hand disinfectant. The volunteers then box the meals which are distributed by Outreach's transport partners to neighborhood agencies in this country - or to foreign destinations. Several hundred volunteers can typically produce 50,000 meals in a couple of hours. Food packaging events are festivals of giving and caring that draw communities and neighborhoods together. They are also fun - often with DJs or live music, celebrities, and entertainment - and even with food and drink stalls and gift & handicraft markets. Most importantly, it brings people together - whether families, neighbors, memberships, or congregations - into team building exercises in which any one, of any age or background, can participate. Virtually every organization that sponsors an event, repeats it again - and the volunteers keep coming back. In fact, Outreach's growth is virally fed by those who attend these events, and then want to organize one for their own church or school. For the cost of the typical Starbucks latte, a volunteer can feed sixteen hungry children. If that same volunteer takes his spouse to a packaging event, rather than than a restaurant, they can feed 200 people. And virtually everyone would make that choice once or twice a year if available to them. Outreach's mobile strategy of bringing meal packaging events to local neighborhoods makes the choice both available and easily accessible. Volunteers and sponsoring organizations know that 100% of money and time donated goes towards packaging meals.